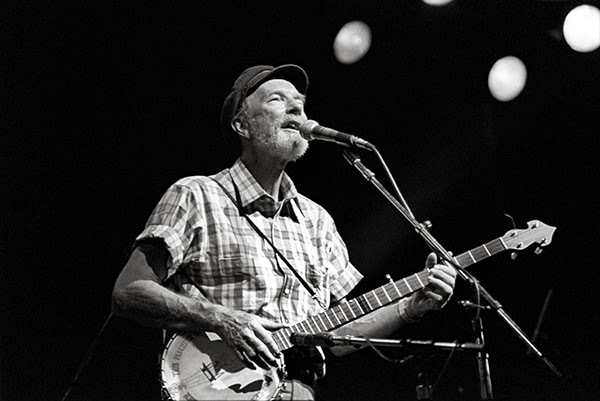 Organizers of an award presentation for Pete Seeger set for New York City next month announced that the event will continue as planned, despite the folk singer's death earlier this week at the age of 94. It will now become a tribute concert dedicated to remembering his influential career. Seeger was scheduled to accept the Woody Guthrie Prize award and perform at New York's Peter Norton Symphony Space on February 22nd, according to Billboard. The event is being organized by the Grammy Museum and Woody Guthrie Center and is now retitled to "How Can I Keep From Singing!" Acts are being booked for the performance, but no one specific has been confirmed. "The only thing I know for certain is that Pete would want us to gather together and make some music," said Woody Guthrie's daughter Nora Guthrie in a statement. "The power of song, as he constantly reminded us, can take us through everything that life, and death, throws at us. On February 22nd, we won't take a moment of silence to remember him. We will take all the moments to sing – as loudly and with as many harmonies as we can muster." There have been no shortage of tributes to the "If I Had a Hammer" and "Turn! Turn! Turn!" singer. Tom Morello called him a "gentle grandfather with a backbone of steel," while Bruce Springsteen led a South African crowd in a reverent rendition of "We Shall Overcome" Tuesday night. "Once you heard this song, you were prepared to march into hell's fire," Springsteen said. "He made me want to be a better person," Dave Matthews said in a statement. "Pete Seeger fought for the working people and he fought against greed, and corruption, and war, and pollution, until the end of his life." Proceeds from next month's event will go to the Woody Guthrie Center in Tulsa, Oklahoma.